March is 'National Nutrition Month"
March is designated as “National Nutrition Month” by the Academy of Nutrition and Dietetics as a way to convey to the public the importance of making informed food choices. Every year, there is a new theme, and this year’s theme is “Enjoy the Taste of Eating Right.” Flavor is the main driving force in what consumers choose to eat – and this does not always lead to the best nutrition decisions. Unfortunately, many Americans have been fooled by food companies into thinking what real flavor actually is – thanks to artificial ingredients and a reliance on added sugar, fat and salt. That being said, this does not mean that healthy foods are devoid of flavor, either. In fact, it is quite the opposite. As many of you know, I write for Your Daily Vegan, a super website for anyone concerned about animals and the ethical vegan point of view. Head over there and poke around - and while you are there, check out my latest blog entry addressing the ridiculous warnings against a vegetarian & vegan diet from a Paleo advocate. 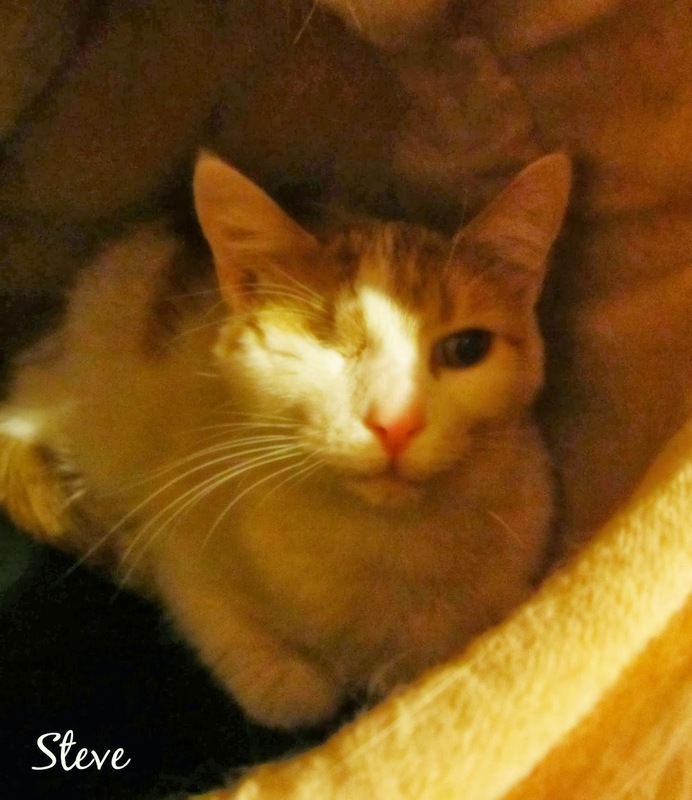 In the meantime, I will be here hanging out with my newest foster feline, Stevie the One-Eyed Wonder. Just a quick reminder that I post over at Your Daily Vegan about all things related to nutrition. I am a bit more consistent on that website, but not by much. I am not sure why I can't get into the rhythm of blogging? I feel like I have a great deal to say about the world - nutrition or not; however, when it comes to sitting down and actually writing about it, "meh" is kind of the feeling that comes over me. It's February, and I am thoroughly sick of winter. I think we have had 53+ inches of snow thus far in Cleveland. My back has felt every single one of those inches thanks to the unending shoveling I seem to do. I am trying to think "Spring," and in the meantime, I have plenty of projects to keep me busy. This year's Cleveland Veg Fest is scheduled for Saturday, June 7th at the Cleveland State University campus. Again, I am on the roster as a speaker and will discuss Maternal Vegan Nutrition. This is a free all-day event, and I hope to see you there! I have also been asked to speak at the Stow-Munroe Falls Library on Tuesday, May 27th on the issue of gluten-free eating. There was a great turn out last year when I spoke about the basics of vegan nutrition, so I look forward to going back to this library. If you don't know, I teach for the Wellness Forum Institute for Health Studies, and they have a Diet & Lifestyle Intervention Course geared towards health care professionals. The summer-long program is approved for 36 Continuing Education credits for doctors, nurses and dietitians. If you are interested in learning more about plant-based nutrition, you should check it out. It has been over a year since I left the traditional "clinical" setting due to feeling like the current system in place is way too concerned with treatment versus prevention - and when treatment is given, it is typically in the form of medication and invasive procedures. I was unsure if I would ever place myself back into a clinical setting ever again. Well, life is full of surprises. I am pleased to announce that I have joined Dr Matha Hackett's LivAware Integrative Medicine practice in Mentor, OH. I will be seeing patients in the office, as well as be responsible for designing nutrition programming for patients & the community. My current office hours are M & W 9a-5p and F 9a-12p. This is an exciting opportunity for many reasons, especially that my services can be billed to insurance if you are a patient of Dr Hackett's. I can also see private pay patients in the office as well. Speaking of private pay, I am still keeping my private practice open if driving to Mentor isn't feasible or you need a weekend or evening time to meet. For more info on my private consults, you can read it here. Please feel free to contact me about other projects, like public speaking, writing, and reviewing nutrition material for print work (books, recipes, etc). So that is a bit of an update from the tundra of Cleveland. What's up in your neck of the woods for 2014?